Fast Cats, Semi-Saber Cats, Super-Fast Cats. Not to Mention the Super-Hyenas! In Part One we learned the frightening facts: Lucy was surrounded by formidable felines. She was too slow to run away and she didn’t have weapons to repel 150 pound leopards or 500 pound homothere saber-tooths. These speedsters have greyhound-like limbs, very long and tipped with nails, not claws. Cheetahs sacrifice climbing ability for acceleration and velocity on the ground. Living cheetahs are leopard size – 120 lbs average. But in Lucy’s time cheetahs were as big as modern lions. These felids had the slinky bodies of leopards with an enlarged upper fang. Their saber teeth weren’t as long or as sharp as a Sword Tooth cat but were far larger than in any modern cat. These are the chunkiest, most heavily muscled saber-tooths. In Lucy’s time, smilodonts grew to jaguar size, were heavier than a leopard, but had even more massive forearms and paws. Climbing would be excellent but speed on the ground was slower than a lion’s. The upper fangs were much longer than those in a Dagger-Tooth homothere. The feline situation looked bad enough. The hyenas made it much, much worse. Lucy’s time saw the maximum diversity among the African Hyena clan. Today, the most advanced pack hunter is none other than the Spotted Hyena, Crocuta crocuta. This is a matriarchal hunter. The biggest males don’t rule. Mom does. The alpha female is bigger, smarter and scarier than the males and she makes most of the decisions. Her sisters are next in charge. The Spotted Hyena has a close-knit social structure, and the dominant females are needed to keep order. It works to the kids’ advantage. If Mom-Hyenas dies, her sisters will help raise the orphans. Hyena clans fan out and go after zebra and antelope, even water-buffalo and young rhinos. The Hyenas run and run and run. They’ve got great stamina. Lucy had to watch out for Pachycrocuta, what I like to callthe Super-Crusher-Hyena. This monster was a close kin of today’s Spotted Hyena but weighed almost as much as a lion – 300 pounds. And the Super-Crusher had jaws with even greater bone-smashing power than in the Spotted Hyena. A clan of Super-Crusher-Hyenas would have instilled fear even in the biggest Saber-Tooth Cat. In Lucy’s time there was a Hyena menace we don’t have today. It was Chasmaporthetes, the Wolf-Hyena. A Wolf-Hyena, seen from a hundred yards away, would look like big-headed Timber Wolf – long-legged, fast, and graceful. Up close, you’d see the Hyena family design. The paws were more compact than a wolf’s and the jaws had meat-cutting teeth were longer and sharper. And there weren’t any big molars in the rear of the mouth. Wolves and coyotes use those rear molars to crunch berries and fruit and other vegetable food. The Wolf-Hyena was more of a pure carnivore. The Wolf-Hyenas must have been the nightmare of mid-sized hoofed stock, and primates of all sizes, including our Lucy. Can’t Bite Back. What defenses Did Lucy Have? Chimps and baboons can bite back. They have big canine teeth, especially large in the males. A 90 pound baboon or ape is a nasty close-in fighter. Leopards and hyenas can get terrible wounds from ape and monkey teeth. But not Lucy. When australopithecines evolved from apes, the canine teeth got small. Lucy had much poorer dental weapons than what her ape ancestors had. Let’s roll-play again…..,you’re Lucy or her mate. You weigh 60 to 90 pounds. What do you do when a pack of Wolf Hyenas come over the hill? You can’t out-run them. You might be able to fight off just one Wolf-Hyena, but not a pack of a dozen. 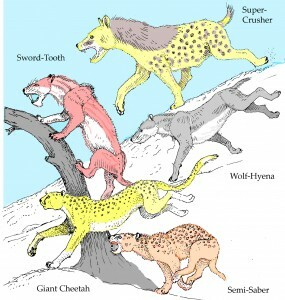 Let’s say by some miracle you get away from the Wolf Hyena clan – then a Giant Cheetah comes at you at 55 mph. Or you’re resting and a Semi-Saber Tooth Cat attacks. Or a smilodont? Old Theories Are Missing Something. BUT….Lucy and her family did get away, again and again and again. They lived long enough to mate and raise kids and evolve. Was a Wolf-Hyena like a hyena in being a scavenger? Then Lucy would just have to keep out of their way, right? Robbers give attack dogs meat, to distract them, what about distractions? I know that is a dumb guess, but I am out of ideas. They protected themselves in groups, got out of dodge when trouble was coming, had an odor cats hate, were helped by aliens…How about a fat clue? What do apes do now? I don’t want to look. A silverback could not take a couple of cats on the hunt. What ape is tougher than the Male Silverback? Some australopithecines DID get eaten. There are Au.africanus specimens that show clear evidence of carnivore trauma. Most of the Au. afarensis fossils are fragmentary, and some may well have been carnivore dinners. Those that survived were able through behavior, habitat, and/or physical characteristics to avoid predators. It was these individuals who left offspring and contributed to the gene pool of subsequent generations. In every generation, the unfit–those that could not avoid predators–were eliminated, and did not live to pass on their genetics. Over generations, the population changed in the direction of the most sucessful individuals. Evolution 101. Previous Post What can you do with 63 hours? Next Post Happy Birthday George Observatory!